1. Clones. Composite Cross. South East Face. 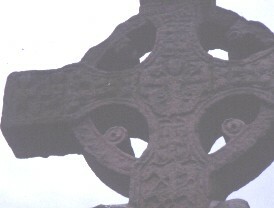 Detailed View of Cross Head. Daniel dressed in a knee length robe stands facing to the front with his arms outstretched the lions, seemingly pushed back by his arms, are curved at either side of him.